The fifth generation Volkswagen Jetta Mk5 debuted at the Los Angeles Auto Show on 5 January 2005. One major change to the Mk5 is the introduction of the first multi-link independent rear suspension in a VW Jetta. Styling reflects a new direction for the Volkswagen brand, with a new chrome front grille, first seen on the Golf Mk5 R32, which has since spread to other Volkswagen models. 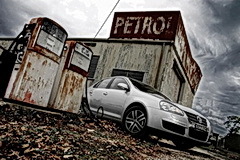 The Jetta available in the U.S., is powered by a 2.5 litre 5-cylinder 20-valve engine in most trims. In North America, the Turbocharged Direct Injection (TDI) diesel engine was not offered in five U.S. states when the Mark 5 Jetta was introduced, due to the tight emission standards promulgated by the California Air Resources Board. In addition to California, four other states adopted the more stringent California standards. touchscreen on sound system is a bit bright for night driving. 40 mpg is easy, with more skill and discpline 50 is possibile under good conditions. Great handling, acceleration, nice look. Car drives nice but the crappy tires that come with it are demolished. I have replaced all 4 tires, 2 due to damage along with broken rims. The car should be able to handle potholes on the east coast. I have wanted this car for about 10 years until now. The 2010 Jetta Se automatic is my first Volkswagen I have ever owned. The reason for Leasing instead of buying is monthly price and low mileage. This car has good weight for ride comfort, power and speed when needed, style inside and out. The features for safety are endless and standard on the SE. The fit and finish on this sedan is one of best I have ever owned. My weaknesses on this Jetta is not with this 2010 Jetta but with the past Jetta's and problems it had with electrical, engines and dependability starting with early 2001 up to now.That was my main reason for not making that purchase due to bad reviews in the past. I realize I have only had this 2010 Jetta for less then 2 months with approx. 850 miles driven, but quality is there and I expect that dependability will be better then in the past.Like I said earlier this is my first Jetta, but not my last! I had A 2008 Mercury Milan Premium automatic 6 speed not the same feel, but a dependable car nothing negative to report on this sedan, but a bit pricey with same equipment as my Jetta. 1: Trunk won't close when it is cold (0 F). Do a google search on this problem. 2: Master cylinder had to be replaced. 3: All power in the driver's side door is gone. Evidently VW's engineers don't know the cable harnesses must be longer than the door travel. The wires in the harness are broken, a common problem with VW Jettas. Check google on this one. 4: The check engine light is on now. I traded it off. DO NOT BUY A JETTA! Quality, fuel ecomony, comfort, and value. Maintenance is simple and relatively inexpensive. The full size spare tire is in the trunk, so it doesn't rust in place under the chassis in a hailstorm of grit and water. Tiny little $1 components, light bulbs. Light bulbs seem to burn out frequently. Purchased replacement bulbs at an after market shop and they seem to last far longer than the factory originals. Fantastic car! Fun to drive, handles very well, plenty of power and economy in the same package. Very comfortable and quiet for long trips. The trunk seems like it was taken from a Crown Victoria its so big. Lots of space for four adults, even 6+ footers. Five can fit for short trips. Maintenance is relatively inexpensive. The brakes are very responsive and the stabilization system lends a great deal of confidence to all situations. Paired with the diesel engine my brakes are still at 80% with over 130,000 km on the car. The car handles extremely well in the snowy winters of Southwestern Ontario. Cold starts are never an issue, even at -30c. This is a well built, great handling, comfortable, and fun to drive car. The engine produces plenty of power to negotiate a variety of road situations. Maximum torque comes in around 1800 rpms, just after the turbo starts to kick in producing a nice power band through to 2700 rpm. The 6 speed DSG is very smooth and a great addition in slippery conditions. The interior is simple but well appointed. Controls are located intuitively and simple to operate. The interior is very easy to keep clean with its lack of complex forms and seams. The exterior finish is nothing short of spectacular. My car drives through a virtual sand blasting for 6 months during our long winters. The finish still looks great and water continues to bead on it. The engineers at VW have built in a beautiful little feature for those of us driving in cold climates. Immediate heat! An electric element is used to provide heat until the engine's heat is sufficient to provide the requested temperature! Brilliantly comforting. WORST CAR EVER! I bought the car because I'm a commuter and thought it would be reliable and have good gas mileage. Since the day I bought it I've had nothing but problems. Windshield wiper motor goes out, alternater, head lights ( only one ever works), noisy starter ( WHEN IT STARTS), ELECTRICAL PROBLEMS!! !, I have had my car at the dealer 6 times with nothing but a large bill. I'm usually back there within a month. Honestly, I'd rather pay to drive a semi then drive volkswagen POS! They are horrible! I wish I had listened to everyone before I purchased the silver piece of junk. Avoid these cars if you can! I've paid close to 5,000 to fix the car overall after the brief warranty was up. ALl in all has been a great car. I average over 500 miles per tank - and have been up to 700 on just highway. So average with mostly city driving is baout 30 mpg. Handling is excellent, interior features - stereo, heated seats, console lighting are pretty high caliber for a car in this price range. Trunk space is huge. Back seat might be cramped for adults if the front seats are back, but I've never heard a kid complain. I've had the car since new and have 60,000 miles on it. Have only had one weird mechanical issue with glow plug that was not covered as I am past warranty. It was a $600. fix which seemed excessive. Other than that, I have no complaints. Odd to see so many bad reviews. Am considering a Mini Cooper but after reading reviews may just stick with my old reliable. I love all the features on the car, very impressive interior, and drives great. I bought my car new a few months ago, and so far I love it!!!! It is so much car for the money,and drives wonderfully on icy Minnesota roads.